Like many groups of African descent Hibberts in Jamaica, there is a high probability that our link to the Hibbert name lies with the British Hibbert Family of Merchants, slave owners and traders that in the mid 18th century controlled almost half of the Jamaican slave trade. Our ties to this family have yet to be pin pointed but the possible connections are by direct decent from the original Hibberts of England and Jamaica, by decent from the ‘second families’ of the Jamaican Hibberts or by working on one of the Hibbert plantations. The British Hibberts had plantation interests in 60 estates during this time and because of this massive Hibbert operation, it is a foregone conclusion that the Hibbert name has spread widely across the island and the globe. Our documented story however, begins with the union of Solomon Augustus Hibbert and Elizabeth Marques Hibbert, born two generations removed from the Abolition of Slavery Act in 1833. Solomon was born in 1873 in St. Catherine. Elizabeth was born in 1876 and was a devout Presbyterian. They lived on Hanna Street, west of the gully; beside the Palm Beach Hotel in Hannah Town. They later moved to Upper Oxford Street. During Solomon’s early years, he was a soldier in the British West Indian Regiment. Later on Solomon became an entrepreneur and bee keeper who manufactured and sold honey. Solomon transported goods by dray cart and mule to Old Harbour, Spanish Town leaving Thursday and returning on Saturday. His siblings were Tabal, Zachius, Mildred, Isaiah, Hezekiah and Nathan. Together, Solomon and Elizabeth had 9 children named Huntley, Lucille, Hannah, Joslyn, Hazel, Herman, Theophilus, Rudolph and Sydney. Elizabeth had 2 girls before Solomon named, Icilda and Violet who migrated to Panama. 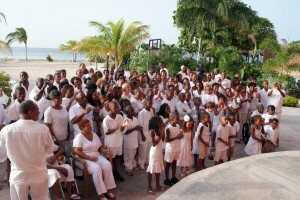 (Fore more information on our Panama Family see pages 2 – 3 of “The Meaning of Reunions” for a Pedegree Chart). Solomon had a son named Aston who migrated to Cuba. It is said that Solomon also had an additional family in Old Harbour. Solomon and Elizabeth gave each of us our DNA but they also gave us something more important. They gave us their values and emotional spirit. By the standards of which wealth was judged, they were very poor, but there is something else of which they endeavored which is our common heritage and strength of character. They taught us that we could admire what others had but we could not envy them. We are expected to achieve through a reliance of industry, hard work, and education and most importantly, trust in God. Originating from humble beginnings, our Family is now a dynamic group of Jamaicans who have migrated to other parts of the world. Among the descendants are hard workers and achievers, professionals, business men and women, doctors, engineers, pilots, accountants and lawyers. Sure enough, our family has risen immensely from the atrocities of slavery. We account for over 180 surnames that are all connected with an unrelenting desire to raise the bar for ourselves and our future generations. The progress of our family is attributed to the foundation laid by our rich ancestry and no doubt our Jamaican pride. This website is a testament to our commitment to continue to raise the bar and give our future generations the tools needed to succeed.